The amount Carnival Cruise Line dining options on a typical sailing can be overwhelming. There are a lot of things which will impact your cruising experience, but few are as important as the main dining room. There are people who will spend the entire week eating at either specialty restaurants or the buffet, but for the vast majority of us, at least a few – if not most – of our meals will involve heading to the main dining room (or MDR as they’re often referred to on message boards). While the experience can vary slightly from ship to ship within the fleet, we thought it might be helpful to offer up a guide as to what you can expect when you walk into the main dining room of a Carnival cruise ship. There are people out there who think that all cruise lines are the same. Of course, those are people who’ve either never gone on a cruise or have only experienced the ships within one line’s fleet. One thing that distinguishes the various lines is their dining rooms. So what can you expect from the MDR’s aboard your typical Carnival ship? Comfort. The general atmosphere is a little bit more casual or relaxed than you might find on some other lines. A while back, Carnival made the decision to remove linen tablecloths from the tables which, to the chagrin of some cruisers, adds to the casual feel. (Don’t worry, the tablecloths still make an appearance on formal nights!) Remember, these vessels are dubbed “fun ships,” the line prides itself on being family friendly and – perhaps most important – waiters occasionally hop up on tabletops and boogie to pop music. You come here for a fun evening, not white-glove service. First introduced to some ships in 2013 and slowly rolled out across the Carnival fleet in the years since, the American Table and American Feast menus offer an array of food choices similar to what you’ll find on comparable cruise lines. American Table is the casual dining menu, while American Feast is offered on formal nights. There are two main differences here, however. The first is that the menus feature region-specific options based on your ship’s itinerary. For example, if you’re visiting the port of Cozumel, Mexico, that night’s menu might suggest you order a margarita to accompany a chicken tostada appetizer and a steak taco entree. These are, of course, simply suggestions, and the menu is full of other options for those wanting something more traditional. And for the adventurous, there’s always the Rare Finds suggestion of a “food you always wanted to try, but haven’t yet dared.” Items which commonly show up here include alligator fritters and sesame crusted shark. The past several years have seen more and more cruise lines offering fewer and fewer opportunities for passengers to dine on lobster, and Carnival is no exception. On cruises of five nights or fewer, the steak-and-lobster option is no longer available on formal nights. (Those who find this an important tradition can still order the lobster or the surf-and-turf combo, but it will come with an additional $20 surcharge.) I wasn’t a big fan of this change at first, but during a recent 4-night cruise I decided to splurge and order the lobster, fearing it would not be of as high a quality as can be found in the actual steakhouse. To my surprise, it was perfectly prepared – every bit as succulent and buttery as you could hope. And given that even with the charge, it was still $15 cheaper than going to the actual steakhouse, it felt like a win/win to me. But even if you forgo the upcharged lobster on shorter cruises, there are numerous American Feast options that might serve as a pretty good substitute, including the blue crab ravioli and the eggplant parmigiana. One of my dining companions had the roasted duck, and declared it a hit. Overall, the food in Carnival’s main dining rooms tends to be hit and miss, and it can vary wildly from ship to ship within the fleet. I sailed on Carnival Triumph out of Galveston in November of 2015, and the food was subpar at best, lacking its usual zest and leaving me underwhelmed. Even the blue crab ravioli, usually one of my favorites, was downright bland. Since then, I’ve sailed on three different Conquest-class ships and have ordered the exact same dish, and it was almost like I had ordered something entirely different. In fact, it was so good on Carnival Valor that I ordered a second plate of it. It’s also worth noting that one bad meal in the MDR does not necessarily mean that you should fear it’ll be a rough week, cuisine wise. During a 2016 sailing on the Carnival Sunshine, my meal the first night was pretty awful. Yet every other meal I had during that 7-night voyage was top-notch. Conga line in the main dining room. Carnival passengers have the option of Traditional or Anytime dining. With traditional dining, you sit at the same table with the same people each night, and can choose between the early seating at 5:45 p.m. or the later seating at 8:15 p.m. Many cruisers like this option as it means that they don’t have to wait to be assigned a table each night, but rather can simply show up when the doors open and go directly to their assigned seat. Because you have the same servers each evening, it also allows you to develop a personal relationship with them. By the second or third night of a week long voyage, they’ll likely have learned enough about your likes and dislikes to make recommendations. It’s worth noting that Carnival has been experimenting with asking those who arrive more than 30 minutes late for their assigned time to eat elsewhere. And this makes sense, given that dining rooms devoted to the Traditional style of dining need to operate like a well-oiled machine, especially at the early seating. Those arriving 30 minutes or more late throw everything off, as everyone else at the table (and, theoretically, in the dining room) will already have perused the menu and likely placed their orders. The Your Time Dining option allows much more flexibility and can be great for people who want to plan their meals around their activities and not the other way around. Of course, the downside to this option is that it generally involves standing in line and/or waiting around until a table becomes available. While both options have their pros and cons, I personally always book the late seating at 8:15. For me, 5:45 is too early to eat, especially on port days when I am just getting back on the ship and want a little downtime before heading to the dining room. Plus, as a big believer that there are few things in life more beautiful than the sun setting on the ocean, I like being out in the open air for the big event. I do, however, prefer the late seating to the Your Time plan, as I like having the same servers each evening. You’d be surprised how quickly and easily you can bond with the staff over the course of a week! Which brings us to a final, but quite important, topic regarding the main dining rooms: tipping. We are constantly asked whether or not people should tip their waitstaff in the dining room, especially given that the cruise lines already charge a daily gratuity fee. This is, of course, a personal decision. For me, it comes down to the quality of service. I almost always tip the wait staff a little something extra at the beginning of the trip and, assuming the service was everything I expected, again on the last night. One thing I have never done – and will never do, under any circumstances – is go to guest services to have the prepaid gratuities removed from my folio. The staff of the ship, including many people who you never actually see, work incredibly hard for the money and deserve every penny of it. 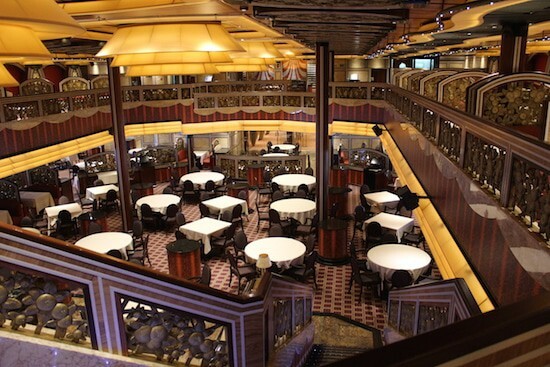 What do you think of the Carnival Cruise Line dining room?